Al Ain: His Highness Shaikh Mohammad Bin Zayed Al Nahyan, Crown Prince of Abu Dhabi and Deputy Supreme Commander of the UAE Armed Forces, has said that new archaeological discoveries in Al Ain emphasise the richness of the history, civilisation and culture of this region, which contribute to the recognition of the nature of its inhabitants. Shaikh Mohammad’s remarks were made while visiting the site of the oldest mosque in the country, which dates back to Islam’s Early Golden Age of the Abbasid Caliphate, 1,000 years ago. Shaikh Mohammad was briefed by Mohammad Khalifa Al Mubarak, Chairman of the Department of Culture and Tourism — Abu Dhabi (DCT Abu Dhabi), Saif Saeed Gobash, DCT Under-Secretary, and Archaeologist Dr Peter Magee, Head of Archaeology at DCT, on the historical and social significance of this discovery, which has shed light on the region and the lives of its inhabitants during that period. Shaikh Mohammad said that these discoveries in Al Ain reflect the city’s status as a cultural centre since the early Islamic period. He also stressed the importance of monuments and heritage in linking the past with the present and the future, noting the importance of historical evidence of urban heritage as a link between civilisations. He pointed out that the status of monuments and their social importance lie in the role they play in forming the identity of citizens, and their understanding of the history, civilisation and life of their ancestors, which strengthens their sense of belonging to their country. 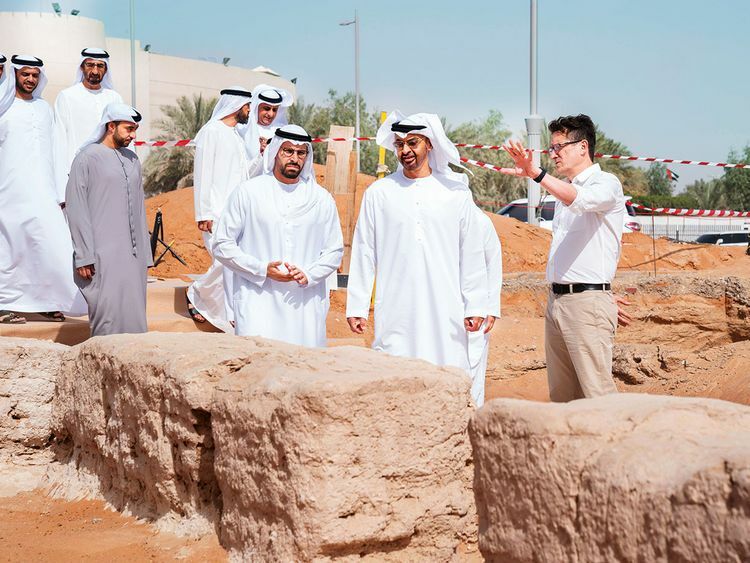 In September 2018, DCT Abu Dhabi archaeologists discovered close to the construction site of the new Shaikh Khalifa mosque in Al Ain several aflaj — subterranean irrigation channels — the remains of at least three buildings and the foundations of a mosque, which is the earliest discovered in the UAE. Meanwhile, Shaikh Mohammad also visited Emirati citizen Nasser Al Otaibi at his residence in Al Ain. Shaikh Mohammad and Al Otaibi exchanged cordial talks about the strong relation between the UAE leadership and its people and the mutual interest to communicate, recalling the approach established by Shaikh Zayed Bin Sultan Al Nahyan. While at Al Ain, Shaikh Mohammad performed Juma (Friday) prayer at Shaikha Salama Bint Batti mosque along with citizens and residents. Shaikh Khalid Bin Mohammad Bin Zayed Al Nahyan, and Shaikh Khalifa Bin Tahnoun Al Nahyan, Executive Director of the Martyrs’ Families’ Affairs Office of the Abu Dhabi Crown Prince’s Court, also performed the prayer, alongside Shaikh Mohammad.